Microsoft has done an amazing job of evolving the SQL Server platform. Looking back from SQL Server 7.0 and SQL Server 2000 to the current crop of SQL Server 2012 and SQL Server 2014 and the upcoming release of SQL Server 2016, it has been quite a journey in terms of feature set and value proposition. No matter how big or small a business is or the magnitude of the SQL Server footprint, one ubiquitous requirement is the need for a relevant Disaster Recovery Strategy. The traditional SQL Server footprint is becoming less defined with the hybridization of storage and the mingling of on-premise infrastructure with the cloud which adds further complexity to your backup and recovery strategy. 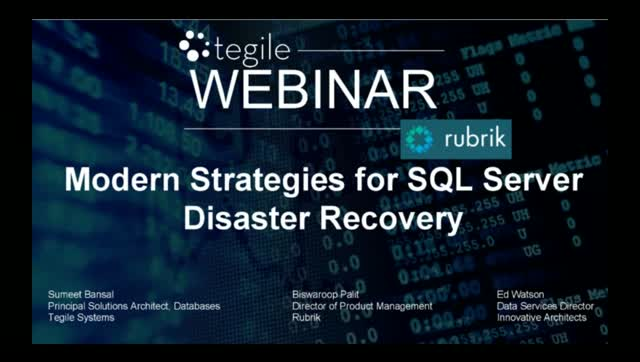 In this webinar we will have three experts talk about a complete solution for modern SQL Server Disaster Recovery requirements. This solution is designed to provide high performance with flash storage, reliability, and the ability to take advantage of the cloud solutions like Microsoft Azure. CFOs rejoice! CEOs take to the streets in celebration! Ok, maybe it’s not quite that exciting, but did you know that you can get the best of both worlds in storage? One of the biggest challenges in storage has been paying for it. Thanks to trying to plan for exactly how much storage you need right now versus how much you need in the future, people often just overbuy with the expensive hopes that they’ll grow into it. You actually have a whole lot of financing options at your disposal to pay for storage, from buying to leasing to simply paying for what you use, just like the cloud. Why pay for storage that you’re never going to actually use? And, what happens when your storage gets too old? You buy new. What if you didn’t have to? What if you could pay a bit more in maintenance on your current system in exchange for an upgrade when the time comes? Rob Commins has been instrumental in the success of some of the storage industry's most interesting companies over the past twenty years including HP/3PAR, Pillar Data Systems, and StorageWay. At Western Digital, he leads the Data Center System's business unit's product marketing team. If it seems like flash storage has been talked about for ages, you’re right! But, there are constant innovations that deserve continuous attention and may help your company find even more value in that staid storage array. From new types of underlying media to new software features to new ways to architect such systems, the storage market continues an ongoing shift from disk-based systems to ones that run all-flash all the time. Among the critical items that you need to understand in the world of flash are the various kinds of flash media available to you, what modern multi-tier architectures look like, and just what the heck is meant by the seemingly oxymoronic “all-flash hybrid” storage array. Join ActualTech Media’s Scott D. Lowe and Tegile’s Rob Commins as they delve into this crazy new world of storage! Customers who are deploying IoT platforms sometimes are forced to make difficult and limiting decisions for their infrastructure. Most application workloads are not consistent in their performance and capacity requirements, further compounding the difficulty on the infrastructure decision. A series of misleading choices often leads to over-engineering and thus overspending, or running systems that cannot meet the application demands. This webinar illustrates an approach for designing and configuring the compute and storage infrastructure for IoT. An ideal compute and storage infrastructure for IoT would have great agility and more than meet all of the technical requirements. It would have a variety of compute, and network personalities that were easy to change, and a storage layer that would support several storage protocols, contain multiple inline space saving technologies, and optimize the use of flash technology from a performance, capacity, and cost perspective. - Storage optimized along both the performance and capacity vectors of flash drive technologies providing great performance as well as extreme capacities. - Fully flexible infrastructure providing several storage configurations allowing for an increase of raw performance with the addition of flash modules or increased capacity by adding cost effective dense storage (flash and/or HDD). - Multi-pool internal architecture that is so in line with the “pooling” methodology internal to many IoT architectures that design and administration complexities are lessened or completely eliminated. ActualTech Media hosted the top innovators in the blazing hot storage industry. Listen to CMO Narayan Venkat explain how Tegile tackles the biggest storage challenges facing organizations today, and see a demonstration of Tegile's IntelliFlash user interface. Five Financial Implications of Solid State Storage. NVMe is a new technology, capable of delivering very high performance and low latency. But most of the conversation has been around the technical innovation. There are wonderful new opportunities, business opportunities that NVMe can expose. This webinar will look at use cases for NVMe in your organization, and how it's integration can enable your business to profit from the technology. Business demands on IT infrastructure are increasing while the pace of change accelerates. In order to support business requirements, companies must understand the value that new storage technologies may provide. Storage technologies are emerging that provide benefits beyond those already delivered by Flash and SSDs. In order to evaluate and plan for these new technologies, it is important for companies to know how to evaluate their business needs in light of these emerging technologies. This session will cover the economic and performance benefits of non-volatile, memory-based storage technologies, along with new access methods known as NVMe. Storage has become the Achilles’ heel for many datacenter applications. It’s become expensive, constantly requires capacity expansion, and requires staff to keep it operational. Many customers are also dealing with the perpetual cycle of costly support and maintenance. Today, there are dozens of different storage options at your disposal. All of these solutions have a place in the market and each one carries its own set of benefits. Whether you’re looking for capacity, performance or TCO savings, an appropriate solution does exist for you. This webinar is your opportunity to get a better understanding of Tegile and the unique differentiation it provides in the storage market. There is no question - flash arrays have made a dramatic impact to high performance enterprise applications. But what about all the rest of the data? There are use cases that require cold data be stored for long term compliance and simple “keep everything forever” company cultures. There are also heavy bandwidth applications that need much more capacity than what's needed to accelerate a database redo log. Come hear about how flash array technologies are advancing to finally deliver on the promise of an All-Flash data center. Tegile 's Rob Commins will discuss these advancements and identify key points for IT leaders to consider as they develop their digital transformation strategy. Traditionally spinning hard disk has been used for cost sensitive applications. Now with the introduction of big data and unstructured applications, such as web 2.0 and video surveillance, it’s difficult to sustain high bandwidth and performance at scale. Over the past few years, Flash has been used to augment spinning disk for low latency, high performance applications, but density and economics have not allowed it to be deployed throughout the datacenter. What if you were able to introduce a multi-tiered flash architecture with the primary tier being performance-optimized and the secondary tier being bandwidth-optimized, all at their highest economical level? Join Roark Hilomen, SanDisk Engineering Fellow and Rob Commins, Tegile VP of Marketing, to learn how to achieve high performance and bandwidth for these next-gen application workloads in a multi-tiered flash architecture. In today's age of connected devices and 24-hour operations, data demand is ever growing, but budgets are not. If you work in Technology for Federal, State and Local organizations, you know it is a big task to keep up with the growing demands for speed, sharing of information, easy access and cybersecurity. When budgets are tight and demands are high, experts recommend creating an infrastructure that will last 10 years. In that way, you can support the needs of today -- and the future. In this webinar, Chris Tsilipounidakis, Manager Tegile Product Marketing, will share how to build an infrastructure that will last 10 years. If you are faced with high user demands and low budgets, this webinar is for you. Plan an infrastructure that lasts 10 years -- and end users will thank you for years to come. The shape of SQL Server is changing in the Modern Data Center. On one side, use of cloud technologies like Microsoft Azure is rapidly increasing, while on the software side, innovative solutions like SIOS Datakeeper is making DR options possible that were previously only theoretical concepts, and finally on the storage side, full stack flash storage solutions from Tegile are providing a high performance backbone that is highly customizable. With so many changes happening simultaneously, one has to think about how to utilize these innovative technologies together to create useful and compelling SQL Server architectures. In this webinar, Denny Cherry, SQL Server MVP and VMware vExpert, shares his ideas on what some of these architectures may look like. Denny, along with Sumeet Bansal, the Principal Solutions Architect for Databases at Tegile, talk about how to use the cloud effectively and how to create a multi-site data strategy. Denny also talks about some useful cloud features in SQL Server 2016. How can you take advantage of new insights to transform your organization? The IT landscape is changing. Devices and applications generate data every millisecond of every day. The Internet of Things (IoT), Machine-Generated Data (MGD) and the 3rd Platform are changing the datacenter game for new crops of applications when it comes to accessing valuable business data. The push to support this digital transformation requires different mechanisms to consume and deploy data services in new ways. Traditional data analysis, infrastructure and management solutions are not engineered for this high-volume, high-velocity and highly diverse data. Join Shaliesh Manjrekar, Director of Big Data Products, Emerging Storage Solutions at SanDisk and Chris Tsilipounidakis, Manager of Products and Technology Evangelist at Tegile as they discuss the ways that customers can take advantage of new insights to transform their organizations and create new business value like never before. Learn how to swing on the Flash Storage vine and tame your SQL Server jungle! Databases are wild! How can you successfully virtualize and provide storage for SQL Server? In this case, what you dont know CAN hurt you! This brand new webinar featuring Gorilla Guide author and SQL expert David Klee will help you get up to speed on the latest advancements in SQL performance optimization and virtualization. Discover everything you need to know to swing effortlessly through the modern database jungle! The basics of SQL Server and SQL workload characteristics. Key considerations for storage architecture with regard to SQL Server. ATTEND THE WEBINAR AND GET A FREE COPY OF THE GORILLA GUIDE TO MODERN SQL STORAGE STRATEGIES! As organizations move into the "3rd platform", they’ll need to discover new ways to support solutions like Private Cloud and Real-Time Analytics. The traditional disk-based storage they're depending on is not keeping up. Flash is transforming datacenter infrastructure performance, capacity and cost to address these challenges. Join Chris Tsilipounidakis from Tegile as he examines the ways of transforming to a Flash datacenter to support various, mixed application workloads in an ever-changing ecosystem. Join us for our live webinar on May 11th at 1 p.m.ET and 10 a.m. PT when Storage Switzerland and Tegile Systems will discuss how the acquisition and operating costs of flash make it feasible to build a private cloud that is responsive to the needs of the business and cost effective. As organizations move into 2nd and 3rd generations of virtualization with VMware, they often experience high latency and unpredictable performance. The traditional disk-based storage they're depending on for their VMware environment is not keeping up. Flash is transforming datacenter cost, performance and capacity to address these challenges. Join Chris Tsilipounidakis as he examines the benefits of transforming to an All-Flash virtualized datacenter to support virtualized workloads. As IT managers roll out new applications or upgrade existing systems, it's important that they have a keen understanding of the latest advancements in storage technology so they can recommend the best approach. In this session, you’ll learn about the latest storage architectures (flash caching, server-side PCIe flash, hybrid, and all-flash) and the pros and cons for each. We’ll also discuss how a well-designed infrastructure can drive IT efficiencies and deliver high availability while meeting your performance SLAs. The transformation of enterprise IT is changing the performance and economics of enterprise storage. Flash storage arrays deliver high I/O and low latency for business applications such as databases, server virtualization and virtual desktops. Hear how our customers achieve business acceleration and unmatched storage capacity reduction.